One of the things I hate about the end of summer (apart from the fact it means that winter is coming) is the end of all those wonderful summer fruits. Yes, you can use the frozen varieties, but if you want fresh fruit you have to look for alternatives. And one of those I turn to is apples. Apples are so versatile. You can use them in so many ways, from pies, to cookies, muffins and crumbles. 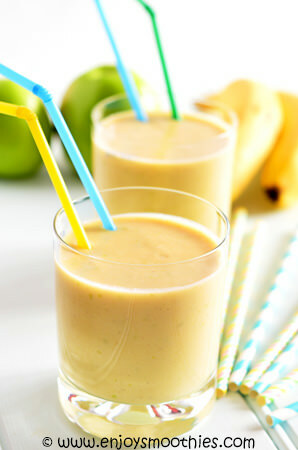 But if you want to stick to the healthy theme, one of the best ways of using them is to make an apple smoothie. 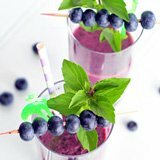 If you haven’t considered adding them to your blender, then I urge you to try these recipes. Apples make delicious smoothies. They add flavour, fiber and nutrients without adding too much sugar. Leave your apples unpeeled. In fact the skins are very high in fiber and antioxidants. But do remove the core and seeds first. Apples are considered one of the “dirty dozen” due to their high levels of pesticide residue. So it’s a given that you should always wash them very well before eating. If possible try to buy organic. Because they aren’t as creamy as bananas, mangos or pears you may need to use less liquid. You can use any type of apple, but it’s worth remembering that green apples such as Granny Smiths are sour. If you want a sweeter taste use yellow or red ones. When buying look for fruit with a smooth skin without any bruises or blemishes. The fruit should be firm when lightly squeezed and have a bit of an aroma. Once you get your apples home, store them away from direct sunlight. Apples will keep in a fruit bowl on the kitchen counter for three to four days. To extend their lifespan place into a plastic bag with air holes and transfer to the crisper drawer of your refrigerator. They will keep for up to a month. If you’ve bought pre-packaged apples check the bag and remove any rotten ones. The old saying “one bad apple spoils the whole bunch” is true. Apples give off ethylene gas and one bruised and rotting apple will spoil the whole bunch. You should also avoid storing apples with oranges. These two fruits do not co-habit well. Both fruits will deteriorate. Apples are high in fiber and vitamin C and low in calories. They help cleanse the system, lower blood cholesterol levels and aid digestion. The phytonutrients in apples help to regulate your blood sugar levels. They are also good sources of vitamins A and B1 and rich in a number of minerals such as potassium, calcium, phosphorus and sodium and high in two important phytochemicals called pectin and boron. 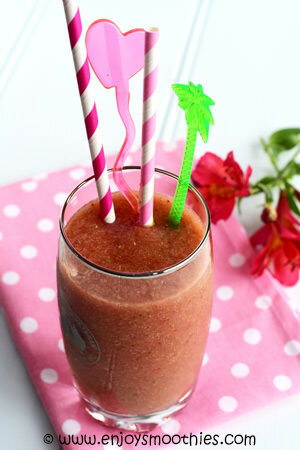 Add the chopped apple, mint leaves, lettuce, strawberries, apple juice and water to your blender. Blend on high until smooth and creamy. 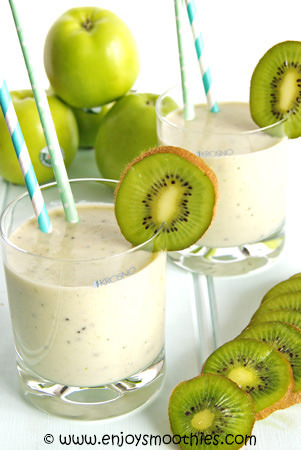 Place the banana, orange, apple and Greek yogurt into the blender and whizz up until smooth. Because oranges and apples have a high water content, you may not need to add any liquid. However if you find your smoothie too thick, add some almond milk or water. 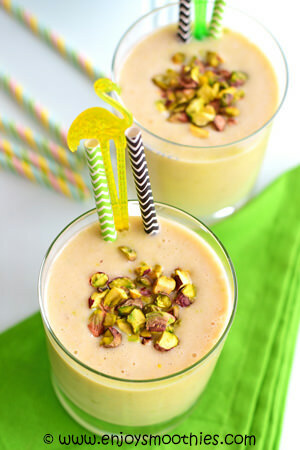 Pour your smoothie into two glasses, chop a handful of pistachios and sprinkle over the top. Enjoy! Peel the kiwi fruit and core the apple. Place the chopped fruit into your blender jug and add the frozen banana and vanilla yogurt. Whether or not you add any liquid probably depends on the type of blender you own. My own high speed blender handled this with ease. If you need liquid add ½ cup of almond milk. Add the chopped apple to your blender along with the banana, peach, vanilla yogurt, almond milk and cinnamon. Whizz everything together until your apple smoothie is velvety smooth.